Just wanted to drop you a line to let you know how the kitties are doing! 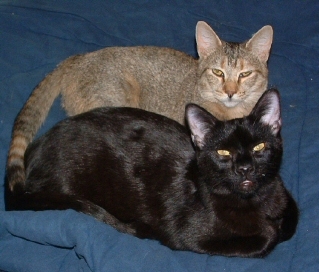 We adopted "Tiny" (who has since been renamed "Bella") and "Bumpster #2" (now known as "Spooky") in November 2006. We couldn't ask for a more loving pair of cats! Spooky loves to snuggle, and will meow and headbutt to get attention, while Bella is content to walk beside you and sit next to you. They also playing with each other, and have been the best of friends since we brought them home. When we opened up their carriers, Bella darted out of hers straight into Spooky's, and they've been inseparable ever since. 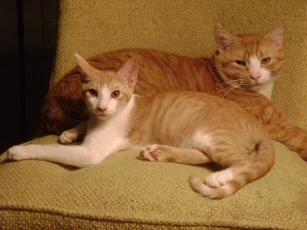 Thank you so much for bringing these two wonderful kitties into our lives! blessing! Everyone is happy, healthy, and getting along so well! Dolce and LaPerla are often found chasing each other around, almost as if they are practicing for the Kentucky Derby. LaPerla loves to swipe the cat toys out of the boys mouth and then run and hide with them. Although the boys are twice her size, the are being so gentle when they rough house! She sneaks up under their belly, bites them and then runs away before they can tell what happened. They chase her down, and when they catch up, they give her a bath! I wanted to update everyone and let you know that all three are doing so well! We were adopted in 2006 and are doing great in our new home. About 1.5 years ago, my wife Danielle and I adopted a cat named Fergus from you. He had been adopted as a kitten and then returned about 2 years later. We fell in love with Fergus right away at the shelter. He even walked right into the cat carrier when we put it down in front of him,..so I think he liked us as well. He spent the first month adjusting to us and our home by going around howling. We believe he was looking for his former companions. He has since completely adjusted and in fact follows his mama all over the house like a dog. He runs upstairs with us every night when we turn out the lights in order to be certain he gets his spot on the bed. Usually that's on Danielle's chest or her pillow. He certainly isn't shy about the amount of room he needs. Although we believe him to be slightly mentally challenged he's provided us with great joy on a daily basis and we are sooo happy to have him. One of the funniest things he does is carry his toys over to us meowing at us when he wants to play. We have decided to set the Pat Brody shelter up on a monthly charitable donation of $25 because we believe that all cats deserve the best fighting chance to live a decent life while waiting for the right family to come along and adopt them. We realize it is a small amount but every little bit helps the cause. We will be sure to forward some photos of him soon and maybe we can see him in a newsletter update sometime soon. I want to let you know how well I am adjusting to my new home. I get lots of attention and the dog & I are fine together--she even lets me sleep in her bed when I want too. 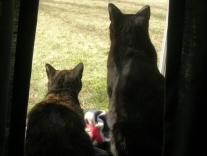 I love my screen porch where I can watch the birds and lay in the sun. Thank you for taking such good care of me while I was at your shelter but it sure is nice having my "own home." We thought we would check in and let you know how Petunia is doing (adopted 10/28/2006). She is the sweetest cat! She loves to sit on our laps and purr. Her favorite thing to do this winter was to lie down in front of the wood stove. She and Lucky have become friends and now that the weather is nice and the windows are open, they sit together. She has been a wonderful addition to our family. My name is Diane Macdonald. 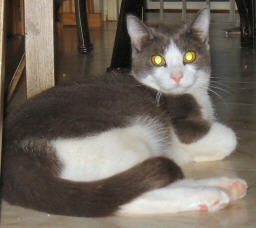 A short while ago, my daughter, Sandra sent you a Email telling you about our cat, William who'd recently passed away. Since he came from your shelter, she wanted you to know he'd gotten very sick with no chance of recovery so I had him euthanized. You emailed back with a very generous offer of a free cat. - Last Sunday, we visited your shelter and chose Pumpkin Puss who came from New Orleans through ARNO. 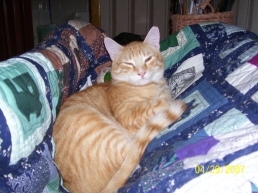 He's a nine month old orange tiger male with a wonderful disposition. We changed his name to Rebel to honor his southern shelter. He has settled in with our other two cats and is always happy. -- He is very friendly, greeting everyone by reaching up and asking to be picked up. He then touches your face gentle pats and lots of "kitty" kisses. We received his records from your shelter and the information for contacting ARNO and we will write them with an update on his name change and current whereabouts and a sincere thank you for sending him up here. Thank you again for your generous offer. P.S. Rebel is a chatter box, when we go to sleep and he is up, he will start chattering so someone will come out and be with him. He also chatters when he is running around the house or wants to be picked up or wants to eat. Thank you again.. 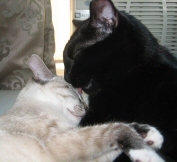 I adopted 2 kitties in January 2003 - Sox and Lanie(formerly Hellion). 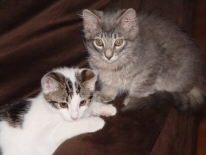 Sox was born blind in his left eye and is a tuxedo kitty, and Lanie came from the same home. 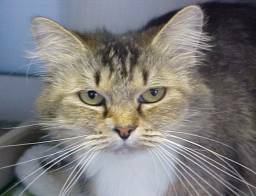 I actually picked out Lanie first, and one of the volunteers asked if I'd consider taking Sox too, since they were from the same home. I took one look at him and fell in love. His eye has never been a problem-he has some depth perception problems, but it doesn't bother him! Lanie is a sweetheart! The volunteers were surprised that I chose her first, especially when I told them that she had come up to me and jumped into my arms, and made me hold her while I walked around. After knowing her for the last 4 years, I understand why they were shocked. She doesn't like to be held and carried around at all! She lets me hold her if I'm sitting in a chair, but the minute I stand up, she jumps down. She LOVES to be petted, though, and kissed on the forehead. They're both very sweet, funny, silly kitties and I love them to pieces!!!! I am attaching pictures of them both. Thanks for all the great things you do! I just wanted to thank you for helping make the adoption possible, we love the boys! Tiki (white) and Stratford seem very happy. I'll keep you updated with their progress if you'd like. I took Benny to the vet to have his ears checked and figure out why he has no trousers. His ears are being treated. Hopefully, when he settles in more, he will stop overgrooming. Nothing is wrong with his skin. My other kitty is seven, and I am thinking that Benny would like to have another young kitty to run and play with. I would like to be invited back to look at your kitties. JUST WANTED TO GIVE YOU AN UPDATE ON HOW AMANDA HAS BEEN DOING. HER NEW NAME IS CALPURNIA (MY HUSBAND NAMED HER-HE'S A ANCIENT ROME HISTORY BUFF) WE CALL HER CALLIE FOR SHORT. WHEN I GOT HER HOME THAT DAY, I LET HER OUT OF THE CARRIER IN THE LIVING ROOM-SHE SNIFFED FOR A MINUTE RUBBED AGAINST THE DOG JUMPED ON THE COUCH AND PROCEEDED TO PURR AWAY. SHE WAS ACCLAIMATED 5 MINUTES INTO BEING HOME!! SHE FOLLOWS US AROUND LIKE A DOG AND LOVES TO CUDDLE ON THE COUCH AND IN THE BED. SHE PURRS CONSTANTLY-SHE DOESN'T EVEN NEED TO BE TOUCHED, AS LONG AS SHE IS NEAR YOU SHE'S HAPPY. 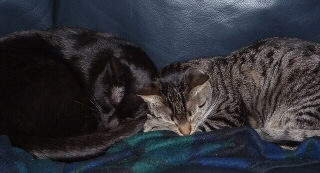 OTHER THAN A FEW SPATS WITH THE DOG THEY ARE GETTING ALONG WELL AND EVEN SLEPT WITH EACH OTHER! HER APPETITE IS GREAT AND SHE'S SO LAIDBACK WITH THE KIDS. IT'S HARD TO BELIEVE SHE WAS STRAY BECAUSE SHE IS SO AFFECTIONATE AND MELLOW! THANK YOU FOR RECOMMENDING HER AND HELPING HER BECOME A PART OF OUR FAMILY, SHE'S A PERFECT FIT!! My fiance and I adopted Lizzie this past January. She is now known as Daisy. She is a really shy cat around people but adapted to her 2 older brothers, Duke and Maxx, just fine. They get a long great. She is coming around to us now. She will jump on the bed at night and let us pet her and she will purr louder than our other 2 cats! Just wanted to give you a little update and let you know that Daisy is doing just fine. I have attached a picture so you can see how big she has gotten. Hello again friends! Just another quick hello from my new home in Framingham, MA. As you can see, I have my good buddy Theo to look after me. I spend my days energetically playing, followed by long cat naps. I have discovered a new talent: ping pong! I delight my humans for hours leaping in the air and batting the ball. Here are some recent photos. As you can see, I've grown. Life is good!